CTAC’s SLO resources are based on 20 years of research and best practices. We have more than 100 field-tested tools, instruments, and protocols that make SLO implementation more effective and manageable. These materials have been used in more than 20 states and more than 1,000 districts. They can be customized to meet the needs of your district or state. The following are representative examples of CTAC’s extensive SLO resources. The Framework portrays the six elements that comprise an SLO. Each element reflects research-based aspects of professional practice, including the bulleted developmental tasks. While each element serves a vital purpose, the elements work together interdependently to form a cohesive goal and actionable plan for student learning. The Teacher Flow Chart is drawn from the four phases of the SLO process: preparation, development, implementation, and results analysis. It identifies key steps during each phase of the process. The important teacher actions are clustered by phase. They show the intentional flow during the year that maximizes the effectiveness of SLOs. The purpose of the SLO Tool for School Leaders is to provide principals and their evaluators a way to systematically and consistently interpret the actions principals take in relation to the SLO process. This tool provides a focused SLO lens for the various ISLLC connection points and links to principal performance rubrics. This SLO is annotated so that it can be used to assess and understand the quality of each element in an SLO and the SLO overall. Based on CTAC’s national experience, there is substantial value in developing an electronic library of SLOs. An annotated library provides teachers and principals with examples of SLOs of varying quality for thought-provoking conversations, rather than exemplars to emulate. 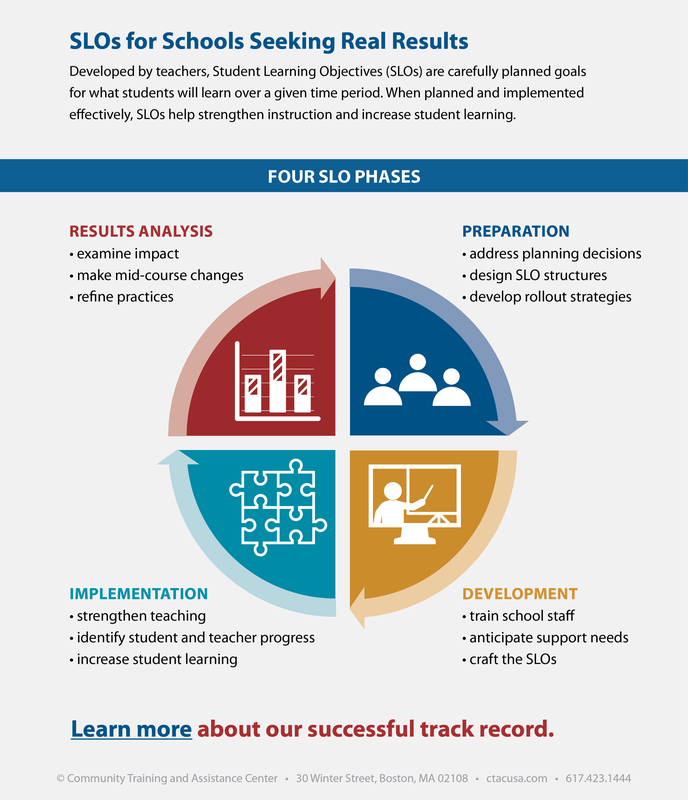 Examining strengths and weaknesses of SLOs helps districts and schools identify next steps needed to support the development of high quality SLOs. Successful implementation of SLOs depends on a set of interrelated policy decisions. Deciding to go the SLO route is a policy decision that triggers many other policy decisions. For each element in the SLO Framework, there are key decisions to make. CTAC uses this guide to help districts and states make decisions that are anticipatory, informed, and consistent. Findings from large-scale, multi-year studies conducted in two urban school districts, Charlotte-Mecklenburg Schools and Denver Public Schools, show a link between well-crafted SLOs and increases in student academic growth. These two comprehensive studies, both conducted by CTAC, analyzed SLO impact on student learning and teacher effectiveness. CTAC’s evaluation of Teacher Incentive Fund-Leadership for Educators’ Advanced Performance (TIF-LEAP) in Charlotte-Mecklenburg Schools showed significantly higher multi-year growth rates in reading (13%) and mathematics (12%) between students of teachers in schools using SLOs and students of teachers in the non-SLO comparison schools. Catalyst for Change is the final summative report for Denver’s landmark performance-based initiative. Findings from CTAC’s four-year study show that elementary, middle, and high school students whose teachers had high quality SLOs outperformed their peers on state and national standardized tests. This report was a linchpin for Congressional approval of the Teacher Incentive Fund. Please note that all of these documents are copyrighted by CTAC. Their use, replication, or modification requires the express permission of CTAC.